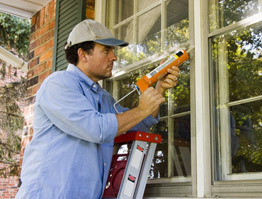 Summer is an ideal time to complete home improvement projects. Whether it’s a landscape update, installing new siding or replacement windows, or building a new deck or sunroom, no project is too big or too small. You’ll often see an uptick in customers at the home improvement stores during summer. The warm weather and longer daylight hours make it a prime time to get outside and catch up on maintenance projects. Summer home improvement projects are also an ideal opportunity for family bonding. Get a head start on your projects by walking around your house to see what repairs need to be done and make a list. Get your kids involved with cleaning up the yard and making minor repairs around the house. Kids can easily see whether there’s wood rot around the porch. Ask them to play detective and look for cracks in the driveway or loose planks on the deck. Once their detective work is done, you’ll have a good idea of where to begin. Next, let’s take a look at three easy home improvement ideas. Window Repair: Adding caulk around windows and doors can help you save on energy bills and make your home more comfortable. This is a fairly simple project that just requires caulk, a caulking gun and putty knife. If this is your first time, practice on a piece of lumber first. The trick is to use the same pressure when squeezing out the caulk and moving your hand along at a steady pace. If your windows are beyond repair and it’s time to replace them, learn more about how to replace your windows with Stanek Windows. Deck/Porch Updates: Another simple home improvement project is nailing down loose deck boards. Loose boards can be a hazard, but they’re easy to fix. Using a nail or screw that will go through the board and into the framing, refasten any loose boards with a hammer or screwdriver. If you’re ready to make larger improvements to your outdoor living space, learn more about adding a screen room or three-season room to your home. Landscaping Improvements: Landscaping is another home improvement project ideal for summertime. Updating your yard is an inexpensive way to add curb appeal to your home. Add some colorful flowering plants such as asters, daisies, dahlia, and iris. The coreopsis grandiflora or sunray is a lovely bright yellow perennial that will brighten up even the darkest corner of your yard. Be sure to trim bushes and trees that require it. Normally pruning will help plants to grow more vigorously. As you move around the yard, keep an eye out for pests like bees, termites, and other insects that might harm you or your family. 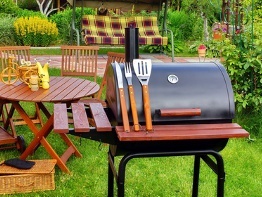 Clean Your Grill: Take a look at your barbecue grill. It will likely need a good cleaning after several months of sitting dormant. Brush away cobwebs and use a specially formulated grill cleaner to wipe away the grime. It’s a good idea to use rubber gloves, since products like this can be absorbed through the pores of your skin. Clean Your Gutters: Be sure to clean out your gutters or hire a professional. A project like this one might be simple enough to hire a teenager to do. House Cleanup and Organization: Other small projects might be pulling weeds from your flower beds, cleaning out the garage, or raking up any leftover leaves. This might be an opportunity to offer your kids some extra cash for a few minor but helpful home improvement projects. Replacement Windows/Sunroom: If you’re considering installing replacement windows, or building a sunroom, try to get bids on projects like these early in the summer. Companies that offer this type of work are often slower during the winter months, but extremely busy in the summer. Reach out to Stanek® Windows or Patio Enclosures® to learn more. Have a summer home improvement project you can’t wait to get started? Our knowledgeable, friendly professionals at Great Day Improvements are a valuable resource. Schedule a free in-home design consultation with a Stanek® Windows or Patio Enclosures® representative for your next window, door, sunroom or screen room project. Contact us today.